Dish up the simple joy of healthy, down-home foods your family will LOVE… tonight. Join 10,098 families served since 2010! We only recommend products and services we wholeheartedly endorse. This post may contain special links through which we earn a small commission if you make a purchase (though your price is the same). Yes, I do have a GREAT recipe for you, Bethany! It's pictured above made in that lovely glass spray bottle — and you can get that glass spray bottle FREE right here for a limited time. When our kids were little, our son especially was soooo sensitive to commercial cleaning products. Any time his little hands or feet would touch a surface that had residue from “normal” cleaning products, he would break out with an itchy red rash (he had eczema really bad). And no amount of Mom's kisses would take the rashes away… I cried over his red, rashy skin a lot. I felt responsible, like I had caused it. I know it's irrational — but that's how I felt. It seemed pretty clear that we needed to rid our home of toxic products — cleaning products, laundry detergent, and even what we used for skin care. No more toxins were going to touch his skin! Over my dead body! Again with the irrational thinking! Anyway, a friend introduced me to an amazing non-toxic all-purpose cleaning spray that had essential oils. It worked soooo well and smelled so good because of the tea tree essential oil… except that it was pricey. I looked at the ingredients and saw that it really only required 3 things besides water: soap, rubbing alcohol, and essential oil. Seemed easy enough. I tried making it myself. And guess what? It didn't irritate our son's skin, and it worked well as an all-purpose cleaner. I was thrilled! Now fast forward nearly 15 years… We're still using that same non-toxic cleaning spray! Ready to see how it's made? Well, I'm showing you on today's #AskWardee! I'm making it in an oh-so-pretty glass spray bottle from Grove Collaborative. After we go through the recipe, I'll tell you how you can get the glass spray bottle, the Seventh Generation dish soap, and even some Seventh Generation hand soap and a kitchen towel — all free! I broadcast #AskWardee live each Wednesday at 10am Pacific (1pm Eastern) on Periscope and Facebook Live. Both the podcast and video replay of this week's show are below. Enjoy! Subscribe to #AskWardee on iTunes, Stitcher, YouTube, or the Podcasts app. I'm looking for a recipe for an easy, natural, non-toxic cleaning spray recipe that works well and also doesn't irritate sensitive skin. I remember your son had eczema. Did you make anything like this that worked well as a cleaner but didn't cause any issues for him? Thanks so much! Bethany, I've got a GREAT recipe for you. It's easy, inexpensive, non-toxic, and it really works. 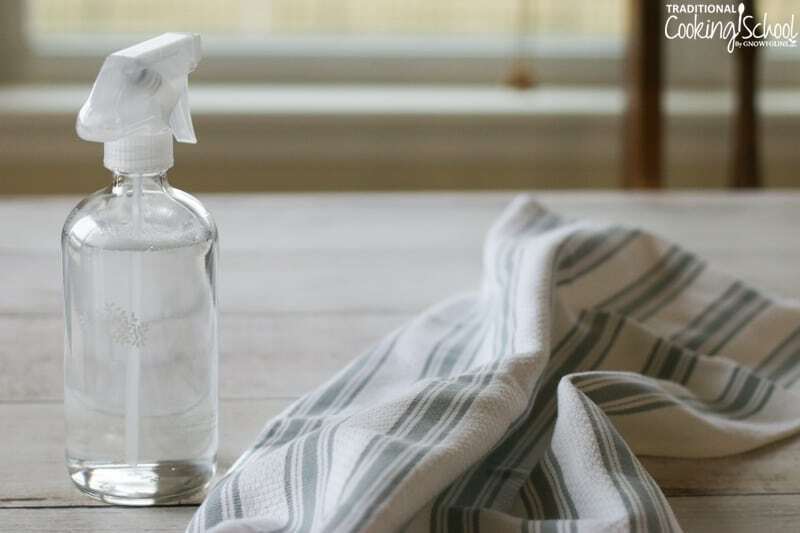 I made up this recipe for natural, homemade, non-toxic all-purpose cleaning spray with essential oils years ago. I copied a more expensive cleaner that I really liked. I looked at the other cleaner’s ingredients and realized I had everything it included. (It only needed 3 ingredients besides water.) So I started making it myself for a fraction of the cost. We use this all-purpose non-toxic cleaning spray for general purpose cleaning throughout the house — kitchen, bathroom, dusting, and more! When I used to make it in a plastic spray bottle, I would even write the recipe on the side of the bottle so others in the household could make more as needed. We keep 1 spray bottle in each bathroom and 1 in the kitchen. Fill to the top with water. To use: spray the surface (or spray onto a cloth) then wipe the surface with a clean cloth. Easy-peasy! You know all about this, right? Then you've got to hear about my new best friend: Grove Collaborative. 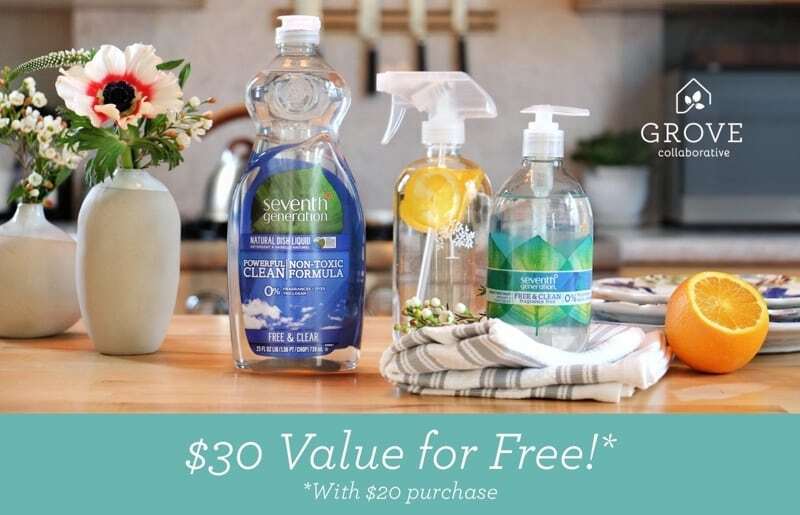 They carry certain non-toxic household items — like the Seventh Generation Dish Soap we've been using for years — at GREAT prices PLUS they price match from anywhere AND they ship what we need right to our doorstep every month. So… not only do I get the products I want at the BEST prices… we don't run out! I don't have to find time to go to the store, I don't have to wait in line, and I don't have to deal with traffic or germs. I'm so glad we found Grove! So glad, in fact, that I asked them if we could put together something special (and free!) for you. They said yes! My contact there, Samantha, created a fantastic non-toxic cleaning package that I am absolutely thrilled to share with you — the Non-Toxic Cook's Cleaning Bundle. It's worth $30 yet you can get it for FREE* with FREE SHIPPING, too, right here. 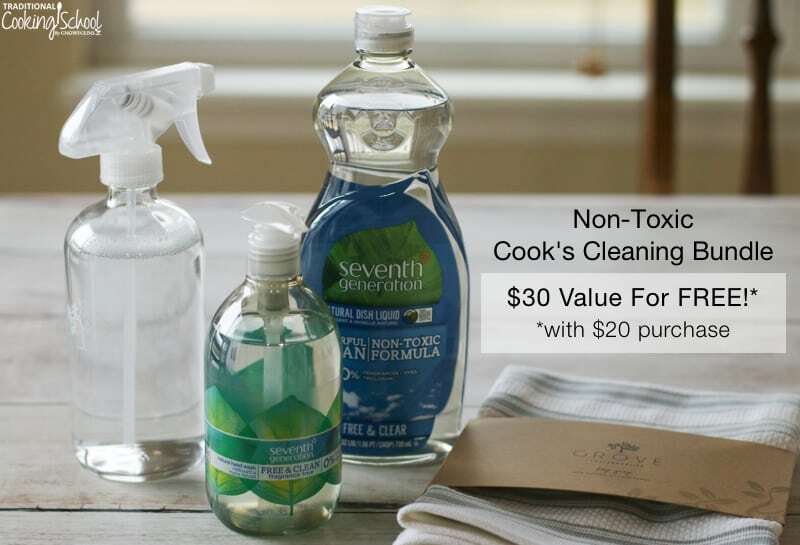 The Non-Toxic Cook's Cleaning Bundle includes: 2 of the Free & Clear Non-Toxic Seventh Generation products I love… the Dish Soap and Hand Soap. Plus that beautiful glass spray bottle and a super-soft 100% cotton kitchen towel, both made exclusively by Grove. 1. Sign up for Grove Collaborative here. You will receive the Non-Toxic Cook's Cleaning Bundle for FREE with FREE SHIPPING when you sign up! Existing customers (click here) will receive a free Seventh Generation Hand Soap with your next order. 2. Answer 4 quick questions about your home that Grove will then use to customize your first basket — this takes under 30 seconds! 3. Once you’ve answered the questions, you can finalize your basket of products to suit your household needs by adding or removing items. 4. To receive this offer, your order needs to be a minimum of $20. With all the natural cleaning and personal care products that Grove carries at great prices, this is absolutely no trouble! Like, you might want to add Seventh Generation Laundry Soap Concentrate (another of our family's staples) or Dr. Bronner's Castile Soap Bars. It's up to you — simply choose the combination of products you would love to receive in your first box. 5. You made it! Click Finish & Pay to place your order. Tip To Save! Once you submit your Grove order, you’ll be signed up for the FREE 60-Day VIP trial. As a VIP, you’ll get free shipping, free gifts, price matching, exclusive sales, and personal service. If you don't love it as much as I do, you can cancel at any time with no hassle! I was skeptical that I would keep my VIP status after the trial, but I saved so much money and time with Grove that I decided to stay on! I really hope you snag this great deal! Hurry, because it all ends soon! What Is The #AskWardee Show? The #AskWardee Show is the live weekly show devoted to answering your niggling questions about Traditional Cooking: whether it's your sourdough starter, your sauerkraut, preserving foods, broth, superfoods or anything else to do with Traditional Cooking or your GNOWFGLINS lifestyle. I share tips and resources, plus answer your questions about Traditional Cooking! What If You Can't Make It? Don't worry. You can catch the replays or listen to the podcast! Come back here to AskWardee.TV; all replays will be up within hours of airing live; the print notes are always posted at the same time I go live. Follow @TradCookSchool on Periscope or Traditional Cooking School on Facebook to view the replay. Subscribe to the #AskWardee podcast on iTunes, Stitcher, YouTube, or the Podcasts app. While you're there, be sure to leave a rating and review! Want To Get YOUR Question Answered? Here's how to submit your question. If we answer it on #AskWardee, you'll get a gift! Please do NOT add future questions for #AskWardee to the comments of this post because they might get missed! I hope you give this non-toxic all-purpose cleaning spray with essential oils a try and let me know what you think! What essential oil will you add? 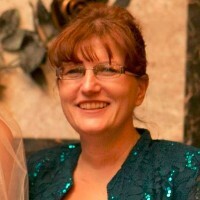 Wardeh ('Wardee') lives in the Boise area of Idaho with her dear family. She's the author of The Complete Idiot's Guide to Fermenting Foods and other traditional cooking eBooks, and she teaches online classes in the fundamentals of traditional cooking, sourdough, cultured dairy, cheesemaking, fermentation, kids cooking, dehydrating, allergy-free cooking, cooking outside, pressure cooking, and more. Connect with Wardee and Traditional Cooking School friends on Facebook, Instagram, Pinterest, YouTube, Twitter and Google+. I just discovered that 7th generation has SLS in it and it appears to be the cause of my husbands allergic reactions. Would another soap, such as castile, work in its place? I was very late in watching your video yesterday, but I did see it today and place my order. I am super excited!! Thank you so much Wardee. Rosie — It’s never too late! 🙂 I’m glad you enjoyed it and you’re grabbing the great deal, too! Thanks so much for sharing! What amount of water please? Hi What size bottle do you use – so that I can work out how much water? I can’t purchase the one from Grove as I am in the Uk. I live outside USA can I still benefit from this offer? When I tried to subscribe in the shipping address section there was no other country to select than USA. We believe it’s US only but you should check with their customer service to be sure. Thank you so much, my son also has really bad eczema and we had no clue what was causing the flare ups. I decided to try your cleaning spray and he hasn’t had a single flare up since I started using it! It’s like magic! Question – why rubbing alcohol and not, say, cheap vodka? You might need to use more vodka to get the same alcohol concentration, but it won’t have the poisonous bitterants rubbing alcohol is legally required to have (it has to be unpotable, which is why you don’t get carded when you buy it) and it’ll be cheaper too, assuming you buy a giant bottle of bottom-shelf stuff. It’ll just be diluted grain alcohol, not a healthy food exactly but a simple food nonetheless. Better, no? Thanks for superb and helpful tips. I’m amazed by your talent. waiting for this kind of article to prepare non toxic essential oil by myself. Our simple weekly menu plans, easy step-by-step traditional cooking tutorials, and private online fellowship will help you make healthy foods your family LOVES to eat! Click here for more information and to get a FREE t-shirt! GNOWFGLINS = God’s Natural, Organic, Whole Foods, Grown Locally, In Season. They’re what we eat! Read more about Wardee and Traditional Cooking School by GNOWFGLINS.